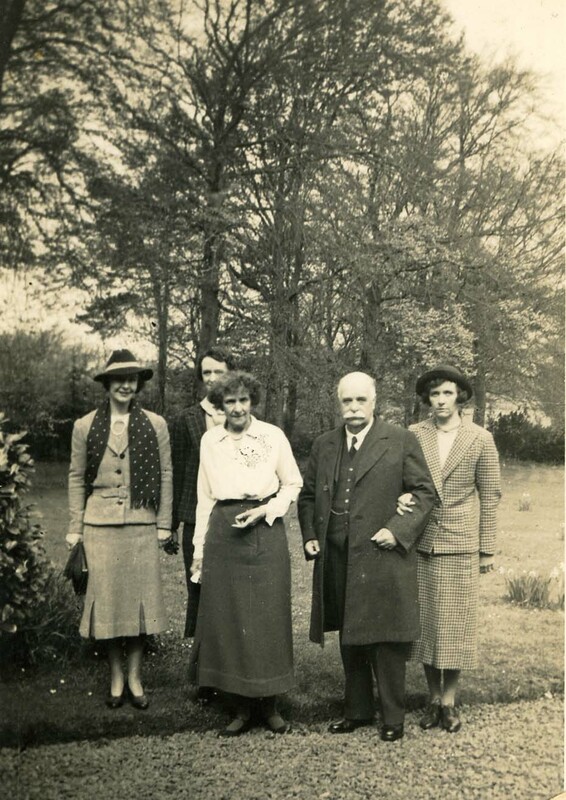 Photographs and information supplied Dr James T. Farquhar, son of James Gourlay II’s middle daughter. Zeta Divisiton in the Glasgow Necropolis. The graves of the Gourlay family are in the NorthWest spur. There have been five burials in it. These are as follows. The history of the Gourlays in St Andrews goes back several centuries and there are many Gourlay graves in the old St Andrews cemetery. 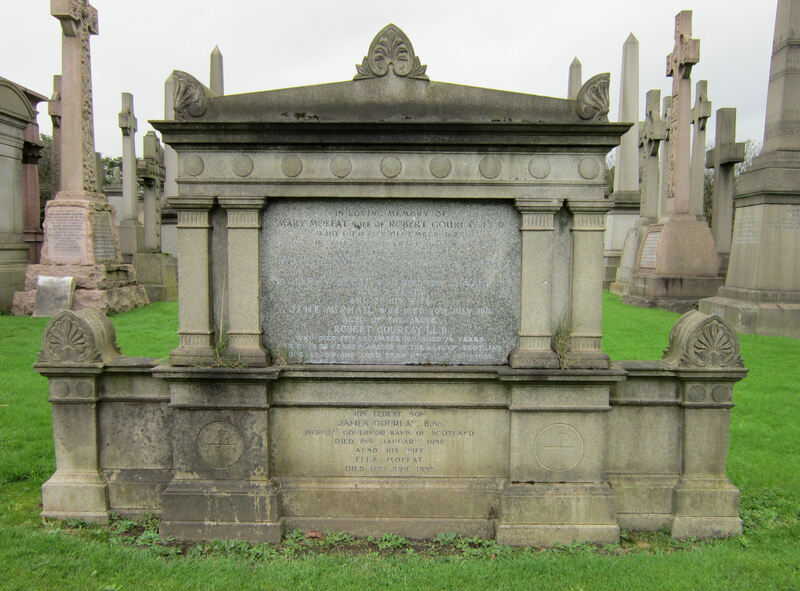 James Gourlay I (1804-1872) moved from St Andrews to Glasgow in 1819 along with his mother Agnes Liddel and his three brothers. Following an apprenticeship, he set up in business with his brother Robert, working as a commercial traveller and in 1838 he established the Commercial Travellers’ Society of Scotland, remaining its treasurer until his death. In 1841 he switched to accountancy, and from 1848-1855 served on Glasgow’s City Parochial Board, where he worked on reforming rates and taxes. About 1853 he retired from business but returned in 1855 in a new capacity. At this time the Bank of Scotland had only one office, in Ingram Street. The Directors now resolved to open a branch in Laurieston, at the south end of the Jamaica Bridge, and they offered the agency to him offering that the branch should not be under Ingram Street, but should correspond direct with head-quarters. Somewhat to the surprise of his friends, he accepted the offer, and he was thereafter known as a banker. frequent snug-box, the simple, kindly manner, the good sense and good humour, the loyalty to the bank, its honour and its interests. Nothing pleased the old man better than to look out from the door of his room and see the counter crowded with customers. It was a treat he could have often enough. He threw himself into his new enterprise with all his old energy: he was well known and well liked: old friends elbowed their way across the bridge to him: and he had the South Side pretty much to himself. (*) The counter soon grew too short, and the little office in Carlton Place altogether too small. A new office had to be built, and the business of the Laurieston branch grew to be one which surprised everybody. 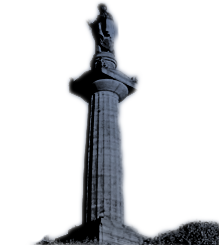 From 1849 he served on the Town Council and from 1853-55 was instrumental in supporting Provost Robert Stewart’s proposal for a clean water supply for Glasgow from Loch Katrine. 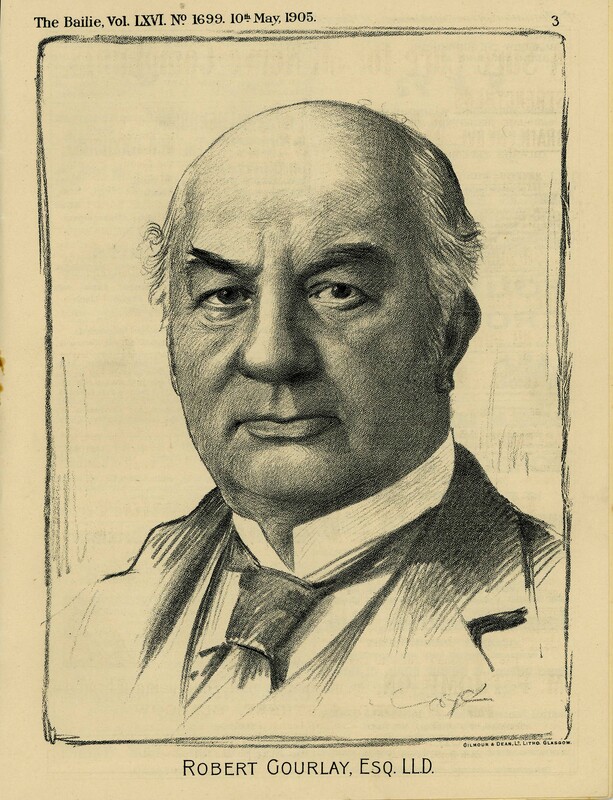 In 1850 he became a burgh magistrate. James I married Jeanie Cleland with whom he spent forty years of a happy married life and who died very suddenly in 1870. He never got over the shock, and died eighteen months later at Bothwell, where he had gone to recruit. 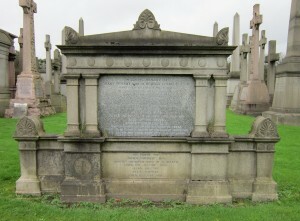 He left four daughters and one son, Robert Gourlay, Manager of the Bank of Scotland, Glasgow who spent his whole life with the bank and is buried in the Necropolis. James Gourlay II (1869-1952) was Robert’s eldest son. He was educated at Kelvinside Academy and took a degree in Mechanical Engineering at Glasgow University. He worked for an engineering company at Polmadie in Glasgow and travelled in Europe selling pumps and other company products. He had put some money into the business but it failed and he recovered much less than he invested. In 1896, James II, who was still living at his father’s home at 11 Crown Gardens, Dowanhill, married his cousin, Ella Moffat in Glasgow. She had been born and brought up in the United States and her father was a brother of Mary (Brown Hastings Gourlay) Moffat. There were three daughters from the marriage. In the 1914-18 war James II became a Colonel in the Royal Engineers and after the war he became a company director of George Outram who published the “Glasgow Herald”. 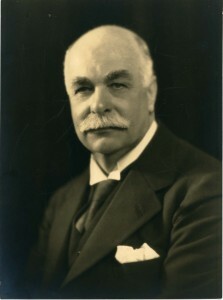 Directors then were appointed largely by family connection and his father Robert had been a director of George Outram previously. 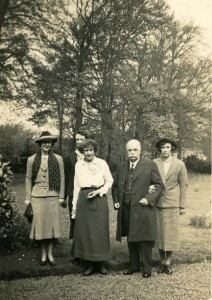 James was extremely fortunate in that shortly after he joined as a director in 1921, there was a major “burst up” within the board and among all the fighting, James II seems to have found favour with both sides and although he had only been with the company for a short time, he was made Chairman. There is no doubt that after the old members departed, James II very astutely invited a collection of his friends to join him. This let him enjoy many years of loyal support which was of great benefit to him as it allowed him to remain as chairman until he was 80 years old and was so deaf that it was clear that he attended meetings and came away having heard not one word of what had been said. As well as director of the Outram Board, James II was also a director of the Bank of Scotland – again no doubt due to his family connections and in 1940 he was made Deputy Governor of the bank. His home from 1923 until he died was at Brankston House, Stonehouse, Lanarkshire. 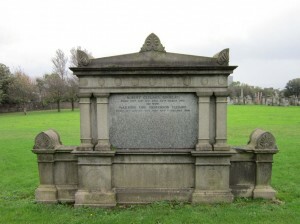 Note by James Farquhar – I am not clear how Mary (Brown Hastings Gourlay) Moffat’s family was able to arrange for her burial in the Necropolis. Her husband at the time of her death was a bank manager and as far as I know there was no previous family connection with the Necropolis.